Every effort is made to bring our dogs to the listed event each week, but due to volunteer or foster commitments Abby A may not be at every event. To find out if Abby A will be at this event, contact Meg. A is for Abby, yes, but also for Adventurous! 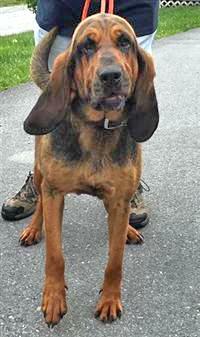 This black and brown beauty has a hankering for fun in the sun, on the trails, on neighborhood excursions, and anywhere else where she can exercise her muscles and her magnificent Bloodhound nose. 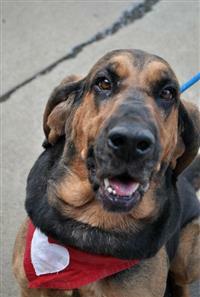 Abby is an extrovert and her lively, enthusiastic spirit will be a great fit for an active family. Bonus feature: Abby is a gentle lady with children and most other dogs. She adores attention, petting, belly rubs, and sweet talk!